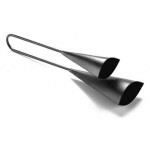 Very traditional in tuning, these Pearl hand-held agogo bells are very popular in Samba groups and as a percussion accessory. Two versions are made, this one and a mountable model. The Pearl 12-inch Steel Repinique will cut through any ensemble. It features a 12-inch diameter steel body and plastic heads. Pearl has designed this model in the colors of Brazil. The rims are designed low for rim shot playing. Strap is included. 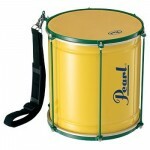 Pearl 10-inch Steel Repinique is also available. 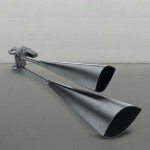 Very traditional in tuning, these Pearl mountable agogo bells are very popular in Samba groups and as a percussion accessory. Two versions are made, this one and a hand-held model. A modern version of the traditional African agogo bell, in a hardwood which produces brightly-pitched tones. 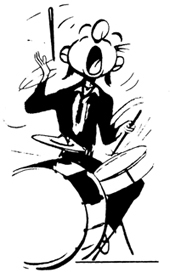 Scrape the ridges or simply tap on the bells for a variety of rhythmic wood sounds. Use the ball end for louder sounds, and the handle for more subtle sounds. The ribbed cups give three different tones. Beater included. Dimensions are approximately 10" x 6.5". 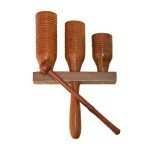 Also available: Wooden Double-Bell Agogo.